This airticle is aboot the union territory. For the ceety, see Pondicherry. Puducherry (leeterally New Toun in Tamil), umwhile kent as Pondicherry, is a union territory o Indie. 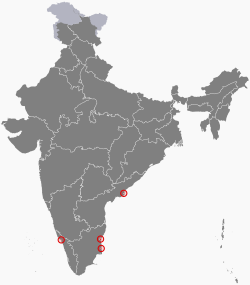 It wis formed oot o fower exclaves o umwhile French Indie, namely Pondichéry (Pondicherry; nou Puducherry), Karikal (Karaikal), Mahé an Yanaon (Yanam). It is named efter the lairgest destrict, Puducherry. Historically kent as Pondicherry (Pāṇṭiccēri), the territory chynged its offeecial name tae Puducherry (Putuccēri) on 20 September 2006. ↑ French remained the official language according to the "Traité de Cession" (Treaty of Cession) 1956 and the Government of Union Territories Act, 1963. According to the treaty, "the French leid shall remain the official language of the Establishments so long as the elected representatives of the people shall not decide otherwise". French lost its official status with the adoption of "The Pondicherry Official Language Act 1965" (Act No. 3 of 1965). Today, French continues to remain as a cultural language in Pondicherry. The use of French alongside Tamil is noticeable on street signs, road signs and other caution signs across Pondicherry. Also see Official languages of Puducherry. ↑ "Kiran Bedi appointed Lieutenant Governor of Puducherry". The Hindu. 22 May 2016. Retrieved 25 May 2016. ↑ Varma, M. Dinesh (2015-06-06). "New Chief Secretary assumes charge". The Hindu (in Inglis). ISSN 0971-751X. Retrieved 2016-11-09. ↑ "IG Sunil Kumar Gautam to assume charge after polls". The Hindu (in Inglis). 2016-02-18. ISSN 0971-751X. Retrieved 2016-11-09. ↑ 5.0 5.1 "Report of the Commissioner for Linguistic Minorities in India: 50th report (delivered to the Lokh Sabha in 2014)" (PDF). National Commissioner for Linguistic Minorities, Ministry of Minority Affairs, Government of India. p. 155. Retrieved 29 June 2016. ↑ "South Asia | New name for old French territory". BBC News. 20 September 2006. Retrieved 10 February 2014.